In keeping with our current quest to find functional stocking stuffers for dealers, we turned to TCB’s brake proportioning valve. 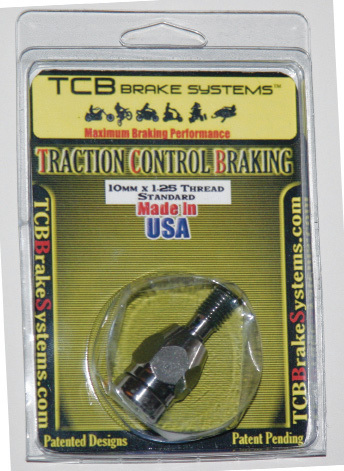 When I was first contacted by Mark Lipski of Traction Control Braking about trying their brake banjo bolt replacement and he said would help stop my brakes from locking up, I was skeptical… I mean, how is a bolt going to prevent lock-up? Mark claims that the TCB bolt is separated into two chambers by a rubber diaphragm. The top portion is filled with air and sealed off, while the bottom chamber has an opening that allows brake fluid to fill it so that when the brakes are applied, there is a sort of shock absorber action of the pads on the rotor. While that made sense on paper, I still had some doubts about how it would work on pavement, so I agreed to try one out. Even if I didn’t like riding with the TCB bolt, it would take only a few minutes to go back to the stock system on my FLHTI. When testing it, I noticed improved stopping immediately. I gradually increased the speed and continued to apply more brake, stopping the motorcycle in ever shorter distances without locking up the front wheel. However, the real test came the following day when I had an unexpected opportunity to really try out my brakes in a panic stop situation when a car pulled out right in front of me. They worked great! 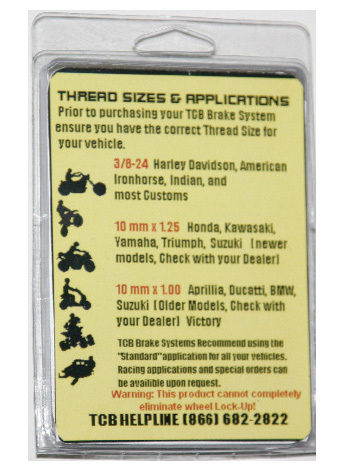 Since then, I have been using the TCB banjo bolt for more than 30,000 miles, and I am not going to take it off just because the "Rode Test" is over. I LIKE IT! 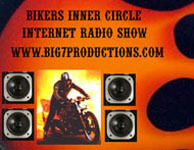 Our consumer counterparts at Biker tried it and liked it as well (see the August 2008 issue). To find out more about the TCB Device or to order one to test, go to www.jvdirectsales.com or call (903) 569-2998 to get price discount details for service shops, dealers and distributors.